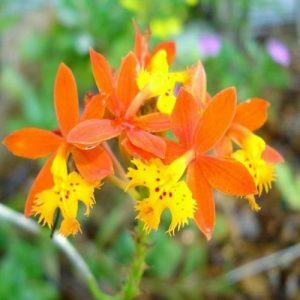 One of the biggest and most diverse orchid genera is Epidendrum because there exist more than 1000 Epidendrum species from tropical Americas. 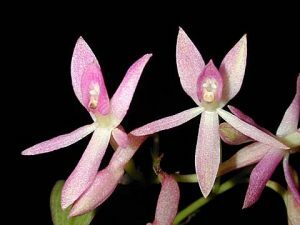 Epidendrum orchids could be found in diverse biomes, in diverse climates, and differences in morphology of Epidendrum species reflect evolutionary adaptation to such diverse habitats. Some of them are typical sympodial orchids with pseudobulbs, whereas there are some caespitose plants and plants with branching stems within this genus, and even monopodial orchids. 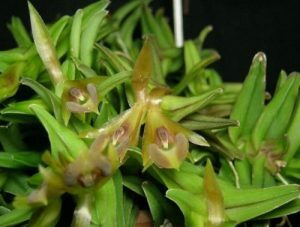 There is a very big group – so-called reed stem Epidendrums such as popular Epidendrum radicans, Epidendrum floribundum, Epidendrum nocturnum and others. 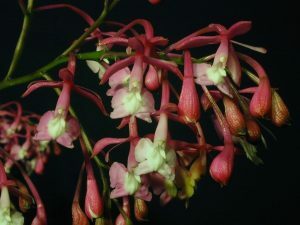 They are medium to large sized epiphytes, lithophytes or terrestrials with simple, cane-formed stems and terminal inflorescence, carrying beautiful flowers – orange upside-down within Epidendrum radicans, green in Epidendrum floribundum and white and with nocturnal fragrance within Epidendrum nocturnum. Plants of this group of Epidendrum are rather easy in cultivation – reed-stemed Epidendrum orchid care is bright filtered light, watering after potting mixture becomes completely dry, potting mixture should be open and well-drained, balanced fertilizers are preferable, temperatures – cool to warm. And there is a very interesting Porpax Epidendrum group – such collectors’ items as Epidendrum porpax and Epidendrum gnomus. They are cool-growing, miniature sized epiphyte plants with cane-formed terete succulent stems with creeping habit (they are forming mats in nature) and lovely shield-like flowers. 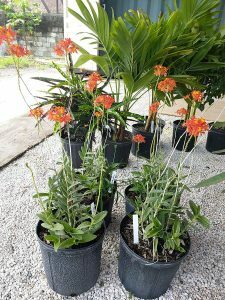 They are not so easy in cultivation such as red-stemed Epidendrums because they are inhabitants of cloud rainforests and need high humidity, cool temperatures and bright light to thrive. They are best grown mounted on slabs, which mimics their nature habit. Epidendrum ciliare and its relatives resemble Cattleya both in shape and habit – they have clavate pseudobulbs with two leaves and have big beautiful white flowers with lovely hairy lips. They need to be grown in warm temperatures with Cattleya level of light and need to be potted into a medium bark, watering after a mixture is fully dry. 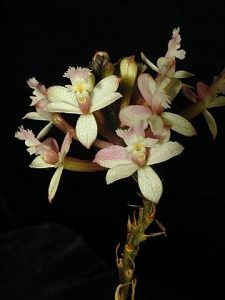 Epidendrum prismatocarpum is a large sized sympodial with conical pseudobulbs, it has the same growing conditions as reed-stemed Epidendrums except that it prefers cooler temperatures and half-shade. Epidendrum marmoratum is a miniature sized epiphyte with cylindrical pseudobulbs and surprisingly big for such miniature flowers with a marmorate pattern of purple on white. This species is best grown mounted on slabs in cooler temperatures and half shade. And extremely special Epidendrum medusae with purple flowers and unusual lips are rather hard in cultivation – they need damp but not a soggy potting mixture (they are prone to rotting) and cool temperatures to thrive.